This post has 4,644 views. Now that I’m a grad student, I travel more than before thanks to various conferences and meetings. Recently, I went on a conference trip to Knoxville, Tennessee. It was my first time in the city (and the state for that matter), and I managed to squeeze in a little bit of sight-seeing in between business duties. Here are some photos and a few thoughts I had about the city of Knoxville. 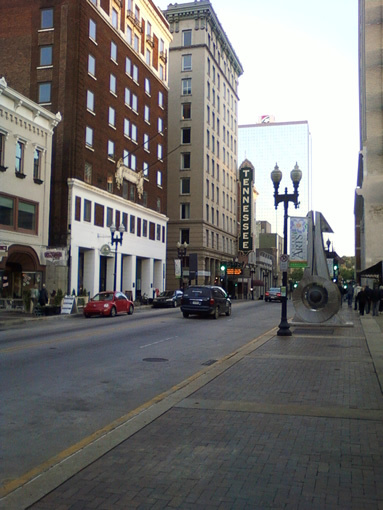 A photo down a street inside Downtown Knoxville. We stayed near the Convention Center/World’s Fair Park area that lies between Downtown and the University of Tennessee at Knoxville (UTK) campus. It’s a pretty convenient area to stay since everything is within walking distance. Due to time constraints, we didn’t have the time to explore the university, but we did walk around the park and the downtown area a bit. Knoxville is the third largest city in Tennessee behind Nashville and Memphis. It’s a medium-small sized city, and I mostly know the city because of the university. The downtown area is not very big, and there are only a couple of tall buildings, but the good thing is that it’s accessible and has plenty of restaurants and other businesses. In downtown Knoxville, we went to a small park in between buildings, and the park had a number of interesting statues. We went to the Downtown Brewery and Grill for dinner. The food was pretty good, and some of the deserts were huge. Despite the restaurant being a brewery, I didn’t drink any beer because we don’t get reimbursed for alcohol. 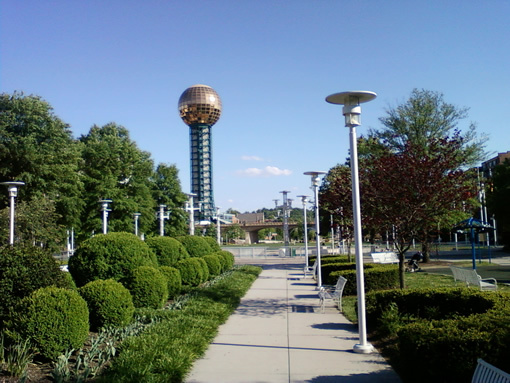 The World's Fair Park with the Sunsphere in the backdrop. The other area I had a chance to look around was the World’s Fair Park. 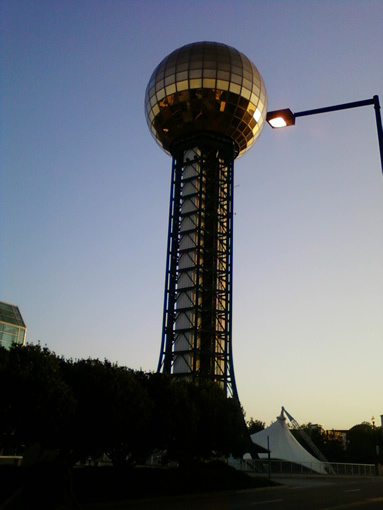 Knoxville held the World’s Fair in 1982, and the site of the fair became the park. From the fair, only the outdoor amphitheater and the Sunsphere observation deck remains. The Knoxville Convention Center is nearby, and the park also has a playground, a historical memorial and some other amenities. The whole site was well maintained, but for some reason the little creek/lake in front of the outdoor theater was devoid of water. The park would have looked better if there was water. 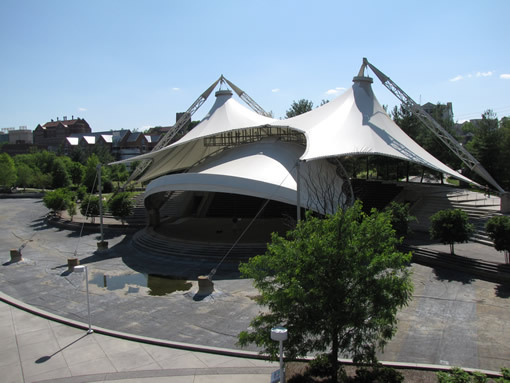 The outdoor theater at the World's Fair Park. Would have liked to watch a performance there but we only saw one guy practicing trombone. The Sunsphere is quite a distinctive-looking structure. The Sunsphere is open to the public at no cost, so of course we went up for a look. The Sunsphere is around 10 stores, so it’s not that tall, but there aren’t that many tall buildings around so you can get a pretty good 360 degree view of the surroundings, from Downtown Knoxville to parts of the UTK campus. 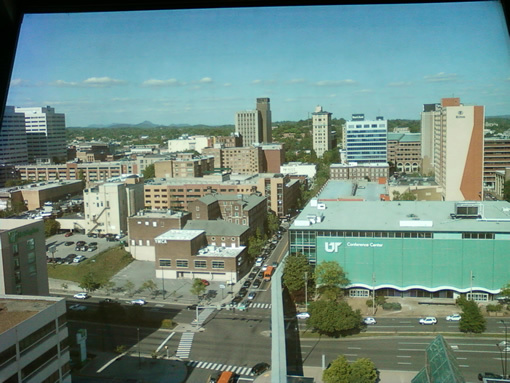 Looking over the convention center into Downtown Knoxville from up in the Sunsphere. From my brief stay, my impressions of Knoxville has been pretty good. The parts of the city I’ve been to look clean and safe, and the location we stayed in was convenient. To be honest, I think Knoxville looks nicer than the town I’m currently living in haha. Lets see if I’ll have a chance to go back again sometimes.